How can we enhance education and improve student success with technology? With over 8,000+ attendees from around the world, the conference is a valuable interchange of ideas at the intersection of teaching, learning, and technology. This workshop explores the impact of virtual reality on education. Participants will experience VR devices to analyze how this immersive wearable technology reshapes the teaching-learning environment and institutional culture. New forms of experiential learning will draw upon visually rich virtual and augmented reality experiences. VR is raising fundamental questions about the shape of future media, narrative and storytelling. Technology is rapidly moving from information access to personal experience, where deeply compelling learning environments are immediately available before our eyes, requiring profound innovation in pedagogy, learning space design and institutional culture. Google Cardboard – 5 million card boards are out, 500,000 are part of the expeditions program. 1.1 million for the New York Times. Benefit is that they are highly mobile. Oculus Rift and HTC Vive – Powerful but often can’t run on the computer as they require a powerful PC. They are also tethered. ZSpace 3D – A 3D monitor for visualization and interaction. Microsoft HoloLens – Portable augmented reality. Meta 2 AR Glasses (large screen projection) – Similar to Microsoft HoloLens (complete unit untethered). Magic Leap – Lightfield displays. Google VR Headset – Possibly coming before IO event. Project Tango by Google – Tango is a mobile mapping project. There is a cinema in Amsterdam that is one of the first VR theaters. Virtual Reality as a New Medium – You are part of the content using your hands and even turning your head. Learning Possibilites – Create new learning resources and go where you couldn’t before with VR. Alchemy Learning offers analytics and data gathering about the virtual reality experiences. Storytelling is a benefit of VR. Nonny de la Pena: Social Advocacy and Documentary Work. Holo-Cinema by Lucas Film Studio is a 1:1 experience that offers engaging full body interaction. Creating a virtual reality playspace and “THE VOID” is an example. Looking to the future how will we answer these questions through the lens of VR? What are the implications for learning as virtual reality blurs the line between reality and illusion? How will virtual and augmented reality accelerate personalized learning? How will virtual reality reinvent the concept of experiential learning? Universities develop and commercialize IP in critical areas, from medicine to particle physics. Yet, despite being the most well positioned for the task, universities have not played as big of a role in developing EdTech. Instead of more technologies in search of a problem, university-grown innovation can help to develop user-focused solutions: technology made for educators, by educators. The university-as-innovation-playground approach allows entrepreneurs to prototype and iterate quickly with faculty and students on campus. Hear from academics-turned-entrepreneurs who have successfully used this approach to develop and launch technologies aimed at the biggest challenges in higher ed. The politics of a university can be a challenge or barrier for innovation – if you intend to commercialize or sustain the idea into a product. Perry Samson from the University of Michigan created the Weather Underground and LectureTools which was recently purchased by echo360. Perry has also created a new incubator called Eduvators out of the University of Michigan TechArb. The University of Virginia’s school of education has generated 5 startups through the Jefferson Startup Incubator. Part of the incubation process involves extensive and rich use of the technology. Rich test beds of options for developers and new ideas can emerge and be engaged by users. How do we best manage innovation at our universities… At scale? Nimble and quick versus our monolithic large universities. The interest in EdTech by faculty should be based on need in the classroom. Do teachers see the value of trying something new in the classroom? What are we providing re: EdTech – that makes your job as a faculty member better or easier. If we know in week 3 that a student is likely to fail – based on data/analytics predications – now what do we do? If we don’t do anything, are we liable? How do we help students succeed is the key question. Everything boils down to this. Some of the value of #EdTech is difficult to evaluate because in many ways we (higher Ed) struggle with valid assessment. Ideas need to be vetted, because you can’t support everyone and some ideas are not ready for prime time. Encourage students to take courses on entrepreneurship to create a culture of idea generation and venturing forward. Delivery of content is 1 piece of #EdTech – but it can be much more. We need a broader definition of student outcomes like initiative, leadership + how do we assess these? What are the REAL problems we are facing now vs what problems we are desiring to solve. Where is our focus and how do we know where to start? Hackathons can generate ideas for solutions. “Kegenars” with beverages allow students (of age) and faculty to have a conversation and generate ideas. Support for bubble up ideas by central administration is important. Every campus should have space to generate and collect new ideas while also putting some money behind it. Stimulate your adventurous side in the SXSWedu Playground, an exhilarating space that promotes discovery through STEM, maker, gaming, virtual learning, accessibility, arts integration and more. Hosted by LEGO Education and VEX Robotics, this exciting destination will feature displays from a number of innovative organizations, as well as dynamic talks and hands-on sessions. Discover, participate and explore in this casual learning space. In spite of wide-spread interest in learning analytics, many educators are still uncertain about what data are available to them, whether these data are relevant to their specific contexts and how to put available data to work in the classroom in a way that is aligned with their values as teachers. This panel brings together thought leaders with experience in business, research, administration, teaching and instructional design to discuss complexities involved in the use of learning analytics, explore the challenges associated with rethinking student success in the 21st century and share some of the innovative ways they are using data to improve the lives of students today. Student intervention: who is the person doing the intervention, what is their motivation, what level of data/tools do we provide the? If you have the data > what are you going to do with it? It’s important and actually ethical to act. Faculty need useful data, faculty need to be convinced that using data is part of their profession and their role, faculty need to be taught what to do (if a student is “red”) what should I do?, faculty need to know they are having an effect. Move analytics and data to action is where to key. Privacy and ethics: who owns the data?, making student data public, are we profiling (and is that problematic)? Re: Data Privacy: What is the “contract” between the student and the institution and what is shared with whom and how. What is the level of transparency that is provided. How can the data be used for students to help themselves. The value of the data back to the student. Do students perceive the value. Additional applications: enrollment and admissions, scheduling and program planning, course design. Based on data from Civitas schools, course grades have signals – students with grades of C in the first year will persist but will not graduate. Looking ahead: Better student decision making (remove the need for interventions), employment to careers is the goal. Can we aggregate data across our institutions to make the data more powerful and helpful to all. Challenges are for gathering up data from a wide array of “off campus” use of eTools in classes. Caliper and Experience APIS are helpful in providing a baseline standard. KEY > Use data to compliment the human intervention and decision making process vs diagnose the underlying cause using the data alone. The data is a signal and a piece, and an important signal. When an action is taken, does it have a positive effect on a student. We need to focus on measuring this interaction. How do we get head of students and give them a “nudge” before it’s too late! Help students make better choices and give them feedback loops as to the impact of those actions. Best known for her work as a pioneering game designer and author of the bestselling books Reality is Broken and SuperBetter, Jane McGonigal, PhD, has also spent the past decade working as a futurist. In this playful one-hour master class, you will learn the three most important techniques of future forecasting, while taking a tour of five of the most surprising potential futures for education in the next decade. The final 15 minutes of this session will be devoted to playing a collaborative future forecasting game that Jane has designed just for the SXSWedu community—you won’t want to miss it! 1930’s world fair, I have seen the future > I am making the future… instead. Because you can shape the future. We think about the future to find out what’s possible. To create something new you have to be able to imagine how things can be different. The future is a place where EVERYTHING can be different. Signals are a clue from the future. Something that catches our eye. Provokes curiousity and imagination. What kind of change does this represent? From what to what? What is driving this change? What is the “future force” behind it? What will the world be like if this signal get’s amplified? What if the trend continues? Become common? Or even ubiquitous? Is that a future we want? Signals are like jelly belly jelly beans. We can combine signals into different recipes to create a variety of futures. What will the world be like in the future by seeing what is available now? Stanford cow simulator reduces meat consumption – you are a cow! What will you do NOW to intervene and make a difference. What would you do in this future to trey to help humanity to survive? Personal foresight can inspire experiments! Imagining the future allows you to be more creative today. LearningIsEarning 2026 – Play the game! What would happen if learning and credentialing were radically decentralized like Bitcoin? What would a system that values learning that happens anywhere look like? A system where anywhere can be a teacher or grant credentials. What if a degree become more like an open ledger? Would you ever graduate? What if learning was treated like a currency? What kinds of new contracts would you create to exchange learning? Bitcoin is the first decentralized digital currency and Blockchain is a shared public ledger open to all. Blockchain also uses cryptography ensures integrity with tamper-proof data and enabling “smart contracts”. Imagine a future 10 years from now. 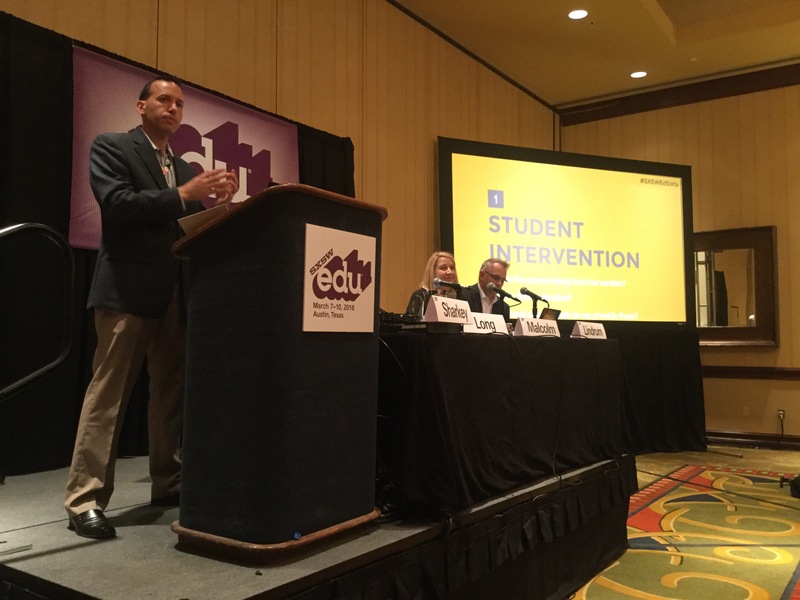 SXSWedu Launch is a fast-paced, live startup competition for education entrepreneurs designed to highlight emerging innovations impacting the world of teaching and learning. Ten early-stage education startups have been selected to compete in the fifth annual Launch competition. While these startups vary in location, mission, structure and the challenges they hope to solve, they all share a passion and desire to create positive change in education. All ten Launch 2016 finalists will take a turn pitching their education startup to the judging panel and live audience in this fast-paced kickoff to the competition. College applicants can create a profile and get a free assessment to help students find and become admitted to a higher ed institution. Experts will provide feedback on a student’s profile to help them get into their desired institution. Game-based learning tools for science. English fluency using AI for linguistics focusing on pronounciation. Personal learning app. The “GPS” for learning. By selecting a topic and narrowing down users are brought to a lesson. Free version access content, and paid version will connect users with a person. Bringing public radio into the classroom. Offers the curating current events for science, social studies, and english. Just announced, Listen Current is partnering with NPR. Content provides real world content and listening literacy. Newzela is a comparison but it is a reading based solution vs Listen Current is focused on listening. A marketplace for finding substitute teachers. Schools can find teachers and connect with them. Paragon One is a video coaching marketplace and adaptive learning platform which guides international students to career success in the U.S. and abroad. Using proprietary algorithms and curriculum, international students are matched with a network of industry experts for training tailored to the challenges of succeeding in the U.S.
Smart Coos is where parents can get live language sessions for their littlest learner. Smart Coos web-based platform provides young children, newborns to age 16, the opportunity to learn a second language with a combination of live-language sessions and automated text nudges based on a language curriculum. Territorium is a gamified social network for education in which students learn by projects, by teaching others and by solving challenges that are recognized with gamification while the platform measures the habilities and competences they develop. Words Liive is a literacy augmentation start-up founded upon a patented a teaching process called CGI (Contemporary Grammar Integration) that isolates grammar structures in popular music, social media, and computer coding to teach reading and writing skills for traditional literature. 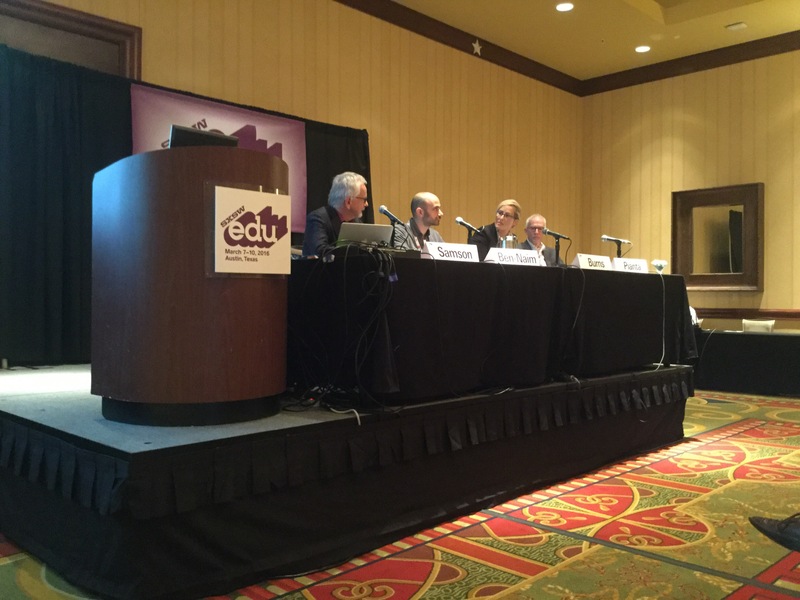 More information about the SXSWedu Startups.